I remember the days when Topshop was a bit like River Island/Miss Selfridge clothes and quality wise but with better quality clothes comes a bigger price tag. Saying that I'm sooo in love with the new collection and don't mind paying that little bit extra (plus I get a 10% student discount so its not all bad). The Union Jack blazer will be mine and even though I have had enough of the floral trend, the grey flower one might be making its way into my wardrobe as well. Also I can't seen to get enough of baby blue/light denim at the mo, probably coz it reminds me of spring and I'm so sick of this crappy weather already, so Topshop ticks that box too by the looks of things. And I'm always partial to a bit of grunge - oversized ripped tshirt/jumper? Yes please! The shoes are looking pretty yummy also - especially the unusual sky blue structured ankle boots. Can see the white gladiator type ones working with a few of my outfits too. 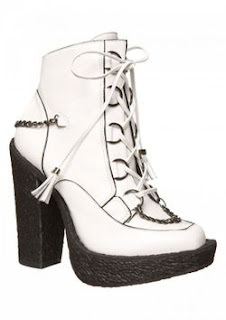 The ones that have been blogged about the most must be the Emma Cook for Topshop ones though. I did not manage to get my hands on the black pair last time so these white ones are on my "must get" list this time - they just look so comfy. P.S - I asked when they will be coming out, I couldn't get a specific date but was told the whole idea is to release them before Fashion Week, so keep your eyes peeled - thats less than 2 weeks away!